Founded in 1906 by Karl Arnold in Nürnberg Germany, K. Arnold & Co. began its life producing tin toys and related items. They produced an extensive line of model ships, doll house items and other toys. In 1935, K. Arnold & Co. hired Max Ernst as their managing director. Ernst, not to be confused with the German realist artist of the same name, was a significant factor in the future of Arnold. Nürnberg was number one on the hit parade for allied bombers during World War II, and, at the end of the war, all of the Arnold facilities were in ruins. Postwar production continued at a facility in the Upper Palatinate (OberPfalz), with the company beginning its slow recovery with the manufacture of window hardware. The postwar operation of the company was under the direction of Max Ernst and Ernst Arnold, son of Karl Arnold. The factory buildings in Nürnberg were rebuilt and the Arnold Company continued to grow. In the postwar period, smaller model train sizes became the order of the day. In earlier times, model trains had been largely the plaything of the well to do who had enough money to live in houses large enough to support the display of the larger scales of model trains. The growth toward smaller scales had begun in the early 1900's, with 'O' scale being the first 'small' scale. In the 1930's, HO/'OO' scale became the 'small' scale. In the late 1940's and 1950's, TT scale was the 'small' scale, allowing for realistic model railroad displays being situated in relatively small areas. Three companies led the TT revolution, H.P. Products of Indiana, USA, Tri-ang of the United Kingdom and Rokal of West Germany. But TT-Scale was not to be the smallest scale in model railroading. Led initially by Lone Star Toys of Great Britain and Trix of Nürnberg, there was a movement toward an even smaller scale. Both companies experimented earlier with “floor toys”, unpowered model trains designed to be moved about by child power. Lone Star dropped by the wayside after a period of time, but Trix continued experimentation and development of what would be their electric powered Minitrix product line. Arnold was to come up with a workable solution, also. The introduction of Arnold Rapido was from scratch because nothing like this had been done before. Arnold was literally establishing what would become 'N' scale. This is not to say that it was the sole developer of 'N', but Arnold Rapido was there first. Although Karl Arnold’s son, Ernst, was involved with the company, several sources cite the presence of Max Ernst, who was Managing Director from 1935 until 1976, as being the prime mover behind this new product line. Ernst has been described as a dynamic businessman, the person most responsible for the introduction of the Arnold Rapido product line. Karl Arnold passed on in October, 1946, leaving his son and Herr Ernst as principals in the Company. Much later, an Arnold Sales Manager, Ferdinand Graef, would marry Max Ernst’s daughter, Sonja, keeping the Arnold company as a family operation. It would continue to be so until 1995. Arnold first offered their electric trains in 1960 under the Rapido brand name. There were several distinct phases of Arnold’s model train production. In the period of 1960 to 1962, Arnold marketed the Arnold Rapido 200 product line. The line was initially very crude yet it became popular because of its much smaller size than TT. The next phase was the period from 1963 to 1967, when the rapido product line began to swing toward scale representations of the trains. During this period the 'Rapido Coupler' came into production, beginning its widespread use by all model train manufacturers in 'N' scale. It is also during 1964 that the term 'N scale' comes into use. N scale is 1:160 (1.9 mm/ft) with a track gauge of 9 mm. The next phase was 1968 to 1970, when the Arnold Rapido line of trains reached maturity. It is during this period that Arnold introduced its turntable and roundhouse. In 1969, Arnold again redesigned their models to compete with the more realistic models being offered by competitors Atlas, Bachmann, Con-Cor, and Minitrix. It is also during this period that Arnold entered into a business relationship with Revell, beginning the marketing of Revell Rapido model trains. This marked the beginning of wide production of North American prototype models by Arnold. After that, the Arnold Rapido line expanded, with continuing development of new models until the early 1990's. 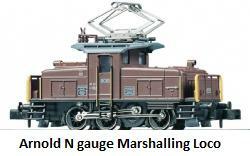 Arnold offered a complete line of locomotives for the American market including the GG-1, freight and passenger cars, track and structures in N scale. Among the locomotives produced were an Alco FA2, EMD FP9, GP7, GP9, and GP30. Steamers included a 4-6-2 Pacific and a 4-6-4 Hudson. As mentioned earlier, Max Ernst retired from Arnold in 1976. At that point, Arnold employed perhaps 200 to 250 people, using three facilities in the Nürnberg area. The Company continued under family control until 1995, when Arnold declared bankruptcy and was sold to the Rivarossi Group of Italy. Rivarossi, in turn, would also go bankrupt, leading to the sale of all assets to Hornby, of the United Kingdom. The tooling was then shipped to China. Under Hornby, Arnold train products are once again being manufactured and sold.